I am working on a project which requires communication from an Arduino Due (Master) and an FDC2214Q1 C to D IC (Slave), but there is some variability as to whether the code works or not depending on seemingly random variables. The code seems to get hung up sometimes on while (!Wire.available()) and if I simply remove that step, I never get the correct Device ID. However, if I simply unplug the DUE and close the Serial Monitor and replug in and upload, it works. I just kind of upload and disconnect a few times and open and close the Serial Monitor and sometimes it works great, other times it gets hung up? Any ideas what could be causing such and issue? 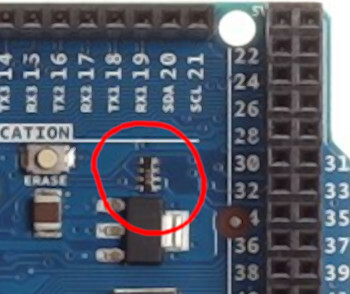 Adafruit tells to avoid the Arduino Due. One of the reasons is the I2C bus. Can you use an other Arduino board? For example one of the MKR boards with a SAMD21 processor. The Due has pullup resistors on the board for SDA and SCL which are too low in value. Sometimes the I2C bus with SDA and SCL works, but sometimes it does not work at all. Perhaps you are able to remove the pullup resistors at SDA and SCL from the board. If possible use Wire1 with SDA1 and SCL1. Those have no pullup resistors at all, so you need to add 4k7 pullup resistors to 3.3V. When you use a library, you might have to change the library to use "Wire1" instead of "Wire". Remove the Wire.endTransmission at the end. That library does not use the Wire library in a proper way. The pullup resistors are 1k5 or sometimes 1k and are located in the upper-right corner, near pin 20 and 21. A value of 1k5 should be okay, when there are no other pullup resistors. When you board has 1k resistors, then I suggest to remove them. Removing them is possible with a soldering iron and a big blob of solder. Check if the board is clean afterwards, for example with a magnifier. Avoid overheating your expensive Arduino Due board. The I2C bus needs pullup resistors to work. A normal value is 4k7. Sometimes there are already 10k pullup resistors on a sensor module. If the I2C has problems, start by using short seperate wires for SDA and SCL. When a cable is used for the I2C bus, then the cable is probably the problem and not the pullup resistors. Not the answer you're looking for? Browse other questions tagged serial i2c arduino-due wire-library or ask your own question.